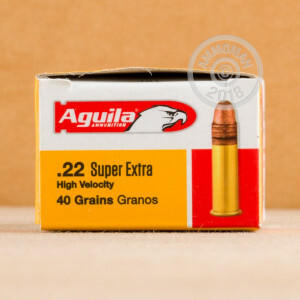 This 22 LR cartridge is made by Aguila, the Mexico-based manufacturer which has been in the game since they were founded in collaboration with Remington in 1961. Aguila has got high standards for their rimfire products, which they routinely test according to exacting Olympic standards. Their meticulous approach to crafting quality components such as clean burning propellants and precisely formed brass casings has made them quite popular with casual and competitive shooters alike. This cartridge sports a 40 grain copper plated solid point projectile. Its plating lets this round create very little fouling, enabling you to preserve your firearm’s accuracy over the course of a protracted visit to the range. 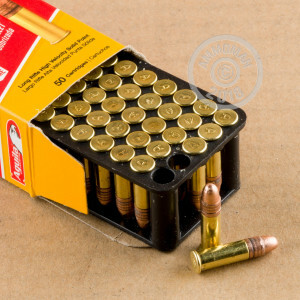 That this round’s bullet exits the muzzle at a velocity of 1,255 fps makes it exceedingly satisfying for target practice -- so fast a projectile conveys the flat trajectory needed to perforate distant targets with mathematical precision, whatever they might be.